Intel will begin shipping its next-generation non-volatile Optane memory for PCs beginning April 24. Intel, which developed the Optane memory with its partner Micron under the name "3D Xpoint," said the new storage will allow PCs to boot twice as fast and increase internal storage performance by 14 times. Additionally, Intel claims the mass storage devices will launch applications faster. For example, Microsoft Outlook will launch up to 5.8 times faster; games will launch up to 67% faster; and files stored in memory can be located up to four times faster. Intel has shown that its Optane memory cards have performed 10 times faster than conventional solid-state drives (SSDs). Intel's Optane M.2 form factor memory module. The Optane memory will come in an M.2 "gumstick" form factor and connect to PC motherboards via storage slots using the PCIe/NVMe 3.0 x2 I/O lane interface. The Optane SSDs use Intel's Rapid Storage Technology (RST) driver, which when placed between a computer's processor and slower SATA-based storage (whether a hard disk drive or SSD), stores more commonly used data and programs closer to the processor. That allows the system to access that information more quickly and improve overall system responsiveness. In simpler terms, Optane acts as a high-speed cache. The Intel Optane memory is available in 16GB (MSRP $44) and 32GB (MSRP $77) capacities. The new SSD does not replace DRAM. For example, if a game requires 8GB of DRAM, you can't use 4GB of DRAM and 16GB of Intel's Optane memory to meet the game's requirement. DRAM continues to be needed for regular PC functions. Additionally, the performance benefit of adding an Optane SSD expansion card will be greater in conjunction with slower mass storage device, such as an HDD, versus a relatively fast storage device like a SATA-attached SSD. Intel and Micron developed 3D Xpoint to fill a niche between NAND flash storage and DRAM, as it's vastly faster than the former and less expensive than the latter. The Optane SSDs can be used to accelerate any SATA-attached storage device installed in a 7th generation Intel Core processor-based platform (Kaby Lake) that is designated as "Intel Optane memory ready." Last week, Intel revealed its Optane drives for data center servers. The drives, with up to 1.5TB of storage capacity, are on their way and users now have a better understanding of how they'll perform. Intel's data center SSDs will fit as add-in cards in the PCI-Express/NVMe and U.2 slots. That means they could work in some workstations and servers based on AMD's 32-core Naples processors. Intel's Optane SSD DC P4800X is targeted at data centers. Micron revealed last fall that it is targeting data center servers for its flavor of 3D Xpoint memory, which it calls QuantX. Those drives are also expected to ship in the second quarter. Sometime later, QuantX may find its way into mobile computer applications, but that won't likely be for some time, according to Jon Carter, Micron's vice president of storage solutions. 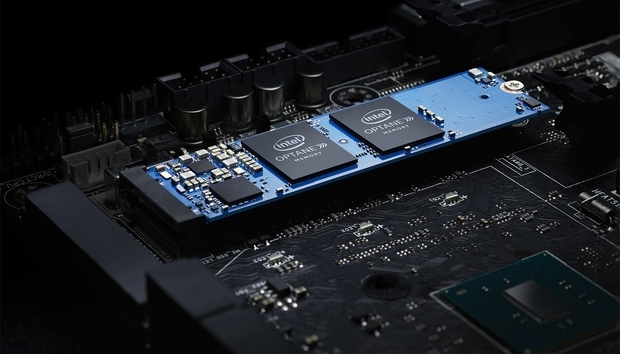 As for Intel's consumer-grade Optane, starting in the second quarter of this year, PC manufacturers such as HP, Dell, Lenovo, Asus and Acer will begin shipping both consumer and commercial products equipped with the new memory, the company said. 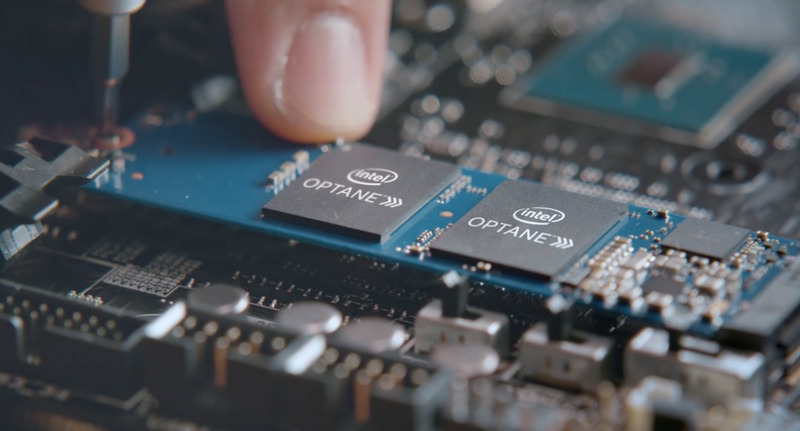 "Intel Optane...will enable new levels of PC responsiveness for everything from compute-intensive engineering applications to high-end gaming, digital content creation, web browsing and even everyday office productivity applications," Navin Shenoy, Intel's general manager for the Client Computing Group, said in a blog today. The new Optane memory specifications indicate it has a sequential read/write speeds of 1350MBps and 290MBps, respectively. But it is the memory's random read/write performance that eviscerates any previous flash memory product. Optane boasts a random read speed of 240,000 I/O per second (IOPS) and random write speed of 65,000 IOPS. Intel has hyped up 3D Xpoint. Last June, Intel let slip its plans for releasing several product lines based on the new 3D XPoint memory, which it said it would release alongside its Kaby Lake processor platform. In January, Intel revealed its upcoming Optane non-volatile memory would ship in the second quarter. "Improving speed while maintaining large storage capacities is ideal for virtual reality, gaming, content creation and video editing and so much more," Intel said in a statement at the time. "The performance of a 7th Gen Intel Core processor plus the speed of Intel Optane memory boosts responsiveness across the system."